The HearYourselfThink Project was created by a wife and husband team who have spent the last decade in the trenches of progressive organizing on a range of campaigns from economic justice to health care reform to protecting our environment. 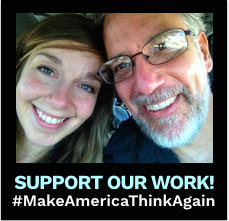 HearYourselfThink Co-Founders Dave and Erin Ninehouser bring years of organizing experience to the urgent task of reclaiming America’s brain from media manipulators and agenda-driven demagogues. Dave and Erin are passionate about taking on toxic media because, as natives of Southwestern Pennsylvania — a region heavily saturated for decades by extremist talk radio and partisan outlets masquerading as “news” — they’ve seen too many goodhearted people gradually pulled into an alternate universe of fear, inflammatory misinformation and groupthink. They’ve watched as friends, family members and neighbors have become more polarized and rigid in their views, with meanness, rancor and pessimism replacing compassion and community connection under the strain of all this negative media. This shift is part of what motivated them to become community organizers, working on a range of progressive issues and campaigns for more than a decade. The number one obstacle they faced was the avalanche of misinformation, cynicism and fear-based narratives coming from the media. Since 2004, Dave has knocked on over 100,000 doors, engaging with voters in Southwestern Pennsylvania, Ohio, Maine and New Hampshire on issues like good American jobs, fair trade policies for American workers and health care (ask him about “the battle of Kittanning”). Learn more about HearYourselfThink’s mission, and how you can help.